Baguio City — Six formands of Casiciaco Recoletos Seminary were formally received into the postulancy stage of formation during the solemn Rites of Investiture held at the seminary chapel last Oct. 12, 2018. 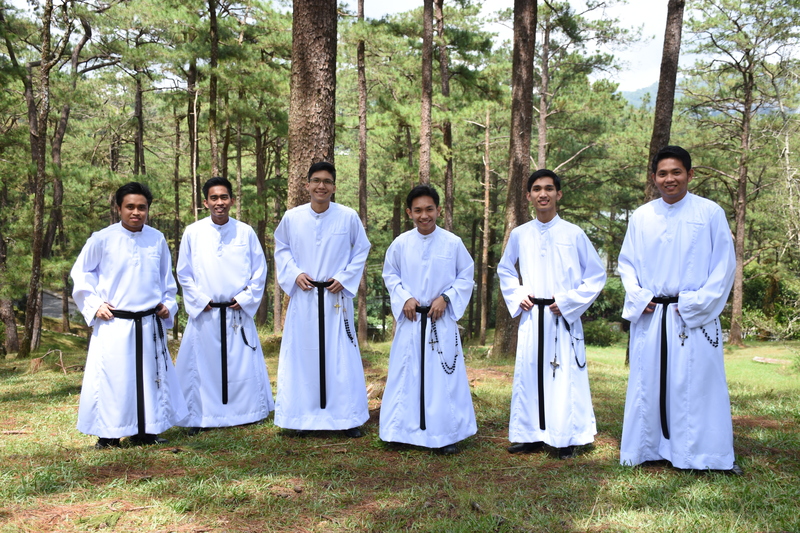 The traditional “Toma de Habito” (loosely translated as “taking of the habit”) of the six-member Batch Heralds was officiated by the Vicar Provincial Rev. Fr. Ian Anthony Espartero, OAR on the joyous occasion of the feast of the seminary patroness Nuestra Señora del Pilar. In his homily, Fr. Espartero said one is afraid at first to say “yes” to the Lord because it entails risks. However, he added, that if one is hopeful, patient and trusting in God’s plans, one is able to solidly say “yes” and remain constant to the commitment one pledges before the altar of the Lord. The postulancy facilitates the gradual entry of the formand from the secular to the religious life by introducing to him certain religious practices peculiar to the Order. Fr. Espartero also issued a challenge to the graduating class, the Batch Martyrs, who stands at the crossroad in their vocational journey. “You better make a better choice because what you decide today will have telling effects of what you will become in the future,” he said. “One simple mistake will totally change the direction of your life, and that is why before you make decisions, make sure that you have thoroughly thought about it,” he added. The celebration was made more meaningful by the attendance of family members, friends, relatives and sponsors of the investees. Present also as concelebrants the different “guardians of vocations” in the different stages of formation, namely: Fr. Gideon Lagrimas, OAR (former vocation director of the Order); Fr. James Castelo, OAR (Pre-Novice Master); Fr. Roland Cepe, OAR (Novice Master); and Fr. Kenneth Onda, OAR (Master of the Professed). Two deacons also graced the ceremony. Rev. Keneth Pahamutang, OAR served at mass while Rev. Robin Ross Plata, OAR led the documentation team in streaming live the event on Facebook.